As healthy as it is delicious, this surprisingly low calorie Tomato Basil Caprese Soup Recipe is a wonderful Weight Watchers Soup Recipe to help fill you up without using a lot of those precious Points. In my photo above, these cheese actually sank a little bit because I used a bit too much broth, and the soup was thinner than what it should be. So, these cheese wasn’t able to melt as easily. But, if the soup is the right texture, these cheese will sit nicely, right on top while you broil it, and melt over the soup in an ooey, gooey, heavenly layer of deliciousness. Roasting the tomatoes and garlic give this tomato basil soup such a gourmet flavor, and is so much healthier. 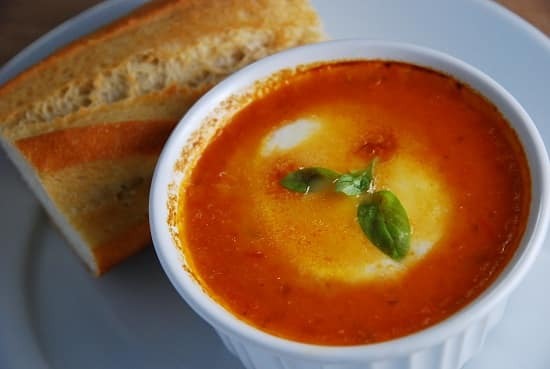 Pair this light tomato soup with your favorite sandwich or salad, and it will definitely help you feel more satisfied. It is DELICIOUS. Enjoy! A deliciously flavorful, creamy and cheesy soup that is easy to make. The fresh, roasted tomatoes add such a decadent taste to this soup and the creamy mozzarella is the icing on the cake. Line a rimmed baking sheet with parchment paper, and spray with non-fat cooking spray. Place whole tomatoes and garlic on baking sheet and roast in oven for about 30 minutes. Meanwhile, set a large sauce pan over medium high heat, melt butter and add in onions and salt. Cook until unions become tender and translucent, about 5 minutes. Dump the cooked tomatoes and garlic cloves into the pot with the onions. Add in basil, stock, pepper and oregano, and stir to combine. Bring mixture to a simmer, and then lower heat to medium low and let cook for about 15 minutes. Remove from heat and stir in ricotta cheese. Now, using an immersion blender, puree the soup until smooth. Season with additional salt and pepper as needed. Pour soup into 8 individual ramekins or oven safe bowls. Slice fresh mozzarella into 8 equally sized slices, and top each bowl of soup with a slice of mozzarella. Place ramekins under broiler until mozzarella melts and begins to bubble. Remove from oven and serve. Wow!!! Made this soup yesterday and it was fantastic. I had to use reduced fat ricotta though because I cant get ANY fat free cheeses where I live. Thanks for all your great recipes, I`m a Weight Watchers member and they help to keep me on track! I made this soup yesterday and it was delicious!! I followed the recipe exactly except I added a few more cloves of garlic. But, I didn’t get 8 1.25 cup servings. You mention in your post that you used too much liquid and that may be the reason. Anyway, it was really good and I will definitely make it again!! This looks so wonderful. Where I live, good fresh tomatoes are impossible to find. Do you have a suggestion how to make this using canned tomatoes? A cold snap is on the way and I’m going to have a favorite cold weather food along with a grilled chesse (Sandwich thins and soy cheese). Thanks for sharing this recipe. it looks easy to make and a very special treat. Ok, I’m a little confused about the mozzarella cheese in this recipe. You say to use 8oz of Buffalo Mozzarella and provide the link for what you used, however the link is for TJ’s Ciliegine in an 8oz container. This is a cows milk cheese- buffalo mozzarella is made from buffalo milk – I’m assuming you are just meaning for us to use fresh mozzarella packed in whey…but that’s not my question. You say to slice into 8 equal pieces – I’m assuming you really used a different cheese as you call for 8oz in the recipe and make 8 servings so you use 1oz cheese per ramekin…so in reality we need to either get a large whole 8oz piece and divide it OR just measure out of the container, 1oz of the small balls of cheese. Ok, let me clarify….I used fresh mozzarella, not actual buffalo milk mozzarella. I will correct that in the post! The one I used from Trader Joe’s had 2, 4oz balls. I sliced these balls into 8 equally sized, 1oz slices. The link was just to identify the brand. That version of cheese comes in 2 large balls, or a bunch of small balls. I think there’s even one with 6 medium sized balls. Sorry about the confusion…but I hope that all makes sense now.